It did even when I place the eggs in exactly the same place as last year. Haha! Oh, I don’t think that helps. Perhaps maybe even moving it a few extra steps from the same place as last year? 😏😂 Nah! 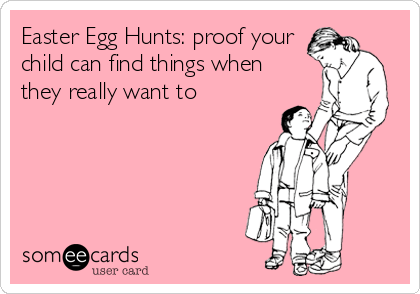 Who am I kidding, they’ll find it regardless. They search and find as if their entire existence depended on it. Oh My Goodness YES! That is so funny…….thank you for the laugh this morning, I needed it. Selective hearing was first. Now selective finding, what’s the selective next? Oh, there is no limit then, just our own insecurities that holds us back.